A peasant, modelled in the round, bends under a heavy load. The surface has been carefully worked to convey subtle differences of texture. The Lenckers were goldsmiths who supplied the leading patrons in Europe around 1600. Sculptural figures in silver were rare and expensive. They appealed to Rothschild taste in collecting in the 19th century. Standing cup; silver parcel-gilt; form of peasant carrying wooden pannier on back; bunch of grapes in left hand, staff in right; head bare; wears kind of sandal; coat open at front with belt; inscribed. Origin: Nuremberg; c. 1570-80; mark of Elias Lencker (master 1562, died 1591). Marks: Both marks have been struck close together on the pannier. (i) Assay mark for Nuremberg, 1550-1650 (R3 3758). (ii) The initials EL in a heart-shaped shield: the punch-mark of Elias Lencker (R3 3951). Commentary: Elias Lencker (master 1562, died 1591) was the brother of the equally important Nuremberg goldsmith Hans Lencker (master 1550, died 1585), and they even co-operated on the same grand princely commissions, such as the famous translucent enamelled silver writing casket for the Bavarian ducal Court, which was first recorded in the Schatzkammer of the Residenz in Munich in 1598 (see H. Brunner, ‘Schatzkammer der Residenz München’, 3rd edn of the Catalogue, Munich, 1970, no. 579; the very fine detail photographs in Hans Thoma, ‘Kronen un Kleinodien’, Deutscher Kunstverlag, 1955, pls 54-5; also J. F. Hayward, ‘Virtuoso Goldsmiths and the Triumphs of Mannerism 1540-1620’, Sotheby Parke Bernet Publications, London, 1976, p. 385. pl. 490). Elias Lencker had been made a master goldsmith twelve years after his brother Hans, but he only outlived him by six years. He should not be confused with the son of Hans Lencker, who was christened Elisäus and became a master goldsmith in Nuremberg in 1591 - the year that Elias Lencker died. There is a most striking double portrait of father and son, which was painted in 1570 by Nicolas Neufchatel (now displayed in the Statens Museum, Copenhagen, on loan from the Carlsberg Glyptotek - illustrated in ‘Wenzel Jamnitzer und die Nürnberger Goldschmiedekunst 1500-1700’, exh. cat., Germanisches Nationalmuseum, Nuremberg, 1985, p. 488, no. 776, fig. 146); the son, Elisäus, died in 1617. The documentary evidence about these - and other members - of the Lencker family who became goldsmiths in Nuremberg and Augsburg is published in extenso in Monika Bachtler, Die Nürnberger Goldschmiedefamilie Lencker, ‘Anzeiger des Germanisches Nalionalmuseums’, 1978, pp. 71 ff., which is based on her doctoral thesis submitted in 1976 to the University of Munich. For a major work by Johannes (Hans) Lencker, goldsmith of Augsburg (master 1602, died 1637), see WB.135, where the maker's punch-mark (two crossed maces within a shield) is reproduced; this personal device corresponds exactly with the coat-of-arms on the Nuremberg Lencker family funerary plaque preserved in the Germanisches Nationalmuseum, Nuremberg (Bachtler 1978, pp. 73-4, figs 2-3). The Lencker family undoubtedly produced several very talented goldsmiths and chasers, both in Nuremberg and in Augsburg, who could attract outstanding commissions from the leading patrons - even from the Imperial Hapsburg Court in Prague - and therefore provide an interesting link between these two great centres of goldsmiths' work in the highly competitive era of the German Renaissance and Baroque. Within the known oeuvre of Elias Lencker (see the ‘catalogue raisonné’ published in Bachtler 1978, pp. 113-22), this figure of the grapepicker is without parallel, though a few examples of silver sculpture from his hands have survived. The most famous is the figure of the Crucified Christ on the Cross, which dominates the devotional calvary of mother-of-pearl, ebony, figural silver reliefs, enamel and precious stones (67 x 37 x 19.3 cm) in the Electoral Kunstkammer, Dresden (first recorded in 1640). Elias Lencker probably finished this great imaginative work by the mid 1570s (see J.L. Sponsel, ‘Das Grüne Gewölbe zu Dresden’, vol. I, Leipzig, 1925, p. 102, pl. 14; also Joachim Menzhausen, ‘Das Grünes Gewölbe’, Leipzig, 1968, (English edn, 1970), p. 87, col. pl. 59). Although the Waddesdon grapepicker figure is described and illustrated in the ‘catalogue raisonné’ (Bachtler 1978, p. 118, no. 11, fig. 48), there is no attempt to date the figure within Elias Lencker's working life of almost thirty years, nor is there any discussion of this exceptional work of sculpture in silver within the general text of Monika Bachtler's article. It has been convincingly argued that before the end of the sixteenth century the leading German goldsmiths, in their search for more ambitious sculptural subjects, began to copy - and adapt - Italian bronzes (see Hayward 1976, pp. 235-6). 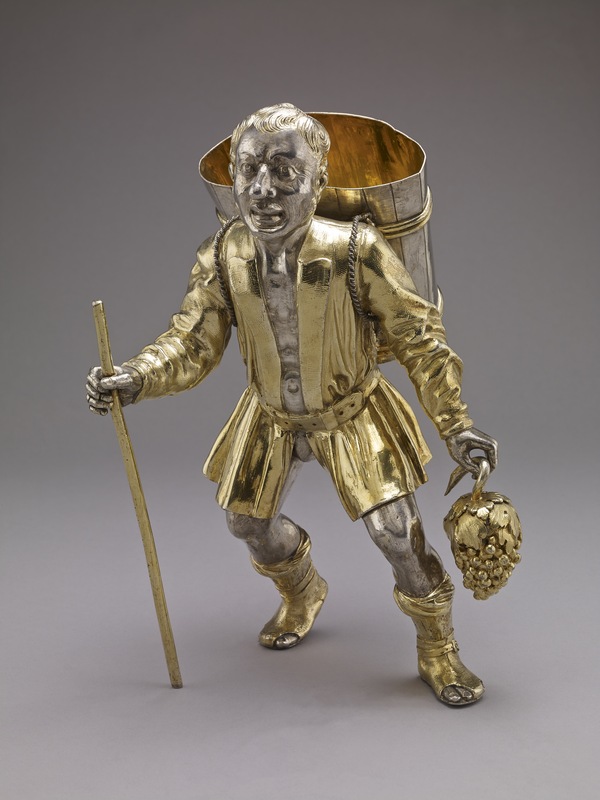 However, this figure of the grapepicker seems to be the product of an entirely local German tradition extending back to members of the Vischer family in Nuremberg at the beginning of the sixteenth century, who were responsible for the very many small sculptures in bronze, so full of character and individuality, that decorate the shrine of St Sebaldus (1508-19). Although some Italian influence has been discerned in the sculptures of the shrine of St Sebaldus, they are recognisably northern and, similarly, if the figure of the grapepicker is compared, for example, with the early sixteenth-century bronze and parcel-gilt figure of Meleager by Antico of Mantua (in the Victoria and Albert Museum; see H. Weihrauch, ‘Europäische Bronzestatuetten’, Brunswick, 1967, p. 118, fig. 137; also, Anthony Radcliffe in ‘Splendours of the Gonzaga’, exhibition catalogue, Victoria and Albert Museum, London, 1981, no. 54, col. pl. 44), it is recognisably Germanic. There is no direct connection between these two figures, but in both the weight of the body is placed on the left leg, the torso leans forward and the gilded drapery parts to reveal an expressive muscular energy beneath; furthermore, the decorative use of gilding - as on the calf-length sandals, loose drapery, hair and whiskers of Meleager - may have been an aspect of Italian Renaissance small-scale sculpture that Elias Lencker and his contemporaries admired and sought to emulate in silver. Nevertheless, the essential qualities of this figure of the grapepicker are not Italianate; indeed, they are to be found only in a few remaining small-scale sculptures - wood, bronze and ivory - from southern Germany about 1600. In the collections of the Germanisches Nationalmuseum in Nuremberg there is, for example, a small model carved in linden wood of a standing peasant holding a goose under each arm (see Weihrauch 1967, pp. 319-21, fig. 390); it is the model for the large cast brass fountain figure that stands in the Obstmarkt, behind the Frauenkirche, in Nuremberg (H. about 69 cm). No documentation on the model or the cast has yet been traced, but in 1973 it was attributed to Hans Peisser, who was granted Nuremberg citizenship (1526-59) and by 1562 was working in Prague (see Klaus Pechstein, Der Bildschnitzer Hans Peisser, ‘Anzeiger des Germanisches Nalionalmuseums’, Nuremberg, 1973, pp. 84-106). It is a remarkable character study, having much in common with Elias Lencker's grapepicker; although the relaxed pose of the goose-man is very different, the strength of the peasant's body is conveyed in a similar way as the clothing opens to reveal his chest and his hose wrinkles below the calves to expose his strong legs. Fortunately, there are two excellently documented sets of similar small peasant figures - firstly, the ivory chess pieces carved in 1611-12 by Christoph Angermair for the famous Pommersche Kunstschrank (now in the Kunstgewerbemuseum, West Berlin; see Michael D. Grünwald, ‘Chrisloph Angermair’, Munich and Zurich, 1975, pp. 26-7, figs 5-8); in particular the bottom right-hand figure, carrying a heavy pannier on his back, with his left leg forward, a stout stick in his hand and his hose rolled below his knees, has a strikingly similar character to the Elias Lencker grapepicker. Secondly, the similar set of ivory figures, which have survived since 1615 in the Brunswick Kunstkammer and are now in the Herzog Anton Ulrich-Museum, Brunswick (see Michael D. Grünwald 1975, pp. 27-8, figs 9-10; in particular, the bearded figure (bottom right-hand), with torn clothes and a heavy pannier on his back, whose dejected pose is powerfully expressive of weariness). The similar set in the Hermitage Museum, Leningrad, which also includes peasants and craftsmen, was published in the Catalogue to the Exhibition ‘Westeuropäische Elfenbein-arbeiten aus der Ermitage, Leningrad’, held at Schloss Köpenick, East Berlin, in 1974 (no. 12) and was attributed to Christoph Angermair, 1615-20, by analogy with those in the Pommersche Kunstschrank of 1611-12 and in the Brunswick Kunstkammer records of 1615. These sets, made by one of the most talented ivory carvers, Christoph Angermair (born in Weilheim, worked for the Munich Court of Maximilian I, died in 1632/3), are evidence of the princely taste of Renaissance Germany, and undoubtedly this fashion for exquisitely carved figures of craftsmen and peasants had spread throughout the courts of northern Europe by the beginning of the seventeenth century. For example, the Danish royal Kunstkammer at Rosenborg Castle has an extraordinarily fine figure group of two peasants dancing, which, although derived from Albrecht Dürer's 1514 print, has been transformed into a courtly objet d'art of about 1600 (see ‘Dürers Verwandlung in der Skulptur zwischen Renaissance und Barock’, Liebieghaus, Museum alter Plastik, Frankfurt, 1981, p. 174, no. 106, figs 48-9). It is interesting to note that the Rosenborg Castle figure group is carved completely in the round and without a base. The rather closely related wooden figure group of two peasants quarrelling, which was listed in the 1670 inventory of the Württemberg ducal Kunstkammer as “eine Schlacht des Teufels mit einem alten Weib”, has survived and is now in the Landesmuseum, Stuttgart (see W. Fleischhauer, ‘Die Geschichte der Kunstkammer der Herzöge von Württemberg’, Stuttgart, 1976, p. 70; also ‘Dürers Verwandlung’ 1981, pp. 174-5, with col. pl. XIII). Like the Danish royal collection figure group, this Württemberg carving is dated around 1600, along with a second version in the Liebieghaus which has no history (see no. 107 of ‘Dürers Verwandlung’ 1981). Apart from these carved wood and ivory figures, there are a few related bronzes, of which perhaps the most interesting is the Squatting Peasant figure in the Kunsthistorisches Museum, Vienna (see Leo Planiscig, ‘Die Bronze-plastiken’, Vienna, 1924, no. 353, with illus., where it was attributed to a Flemish workshop and stated to have been transferred in 1880 from the 'Antikenkabinett'). It has an intense quality that may be more directly related to southern German sculptures than to any extant Flemish bronze figures, even the peasant carrying a small basket in his right hand in the Rijksmuseum, Amsterdam (illustrated in Weihrauch 1967, p. 342, fig. 415, where it is described as “Flemish, c. 1560/70”). Certainly, the distinctions between Flemish and German bronze statuettes at this date are not well defined, but perhaps enough evidence has survived to demonstrate that Elias Lencker's grapepicker is in the mainstream of southern German late sixteenth- and early seventeenth-century genre sculpture. In silver, the losses have been so great that comparisons are no longer plentiful, though several minor versions of the figure of a grapepicker have survived, greatly reduced in scale and each forming the stem of a tall ‘Traubenpokal’ - for example, the three 'bunch of grapes' cups in the Grünes Gewölbe, Dresden (see J.L. Sponsel, ‘Das Grüne Gewölbe zu Dresden’, vol. II, Leipzig, 1928, p. 182, no. 16). The Grünes Gewölbe also contains the extremely beautiful group of the Baptism of Christ signed and dated by Daniel Kellerthaler in 1617 (see Sponsel vol. II, 1928, p. 248, no. 49); the kneeling figure of Christ, with the feet projecting out beyond the edge of the bank, is a powerfully modelled work of free-standing sculpture. Similarly, the kneeling shepherds in the Nativity Hausaltar in the Treasury of the Loreto in the Hradschin Castle, Prague (see H. Seling, ‘Die Kunst de Augsburger Goldschmiede 1529-1868’ 3 vols., Munich, 1980, p. 238, fig. 53) are expressively naturalistic, free-standing figures. They have no bases but stand and kneel, like actors, on the steps leading up to the crib; the shepherd in the centre genuflects with his right leg and his right foot extends beyond the edge of the step, while his left leg and knee support the weight of his gift. The shepherd on the right leans forward, placing his weight on the staff in his left hand and on his two bent legs. These figures are wonderfully expressive and this large Hausaltar was undoubtedly made in the Augsburg workshop of Abraham II Lotter, probably around 1620. An almost identical version of the central part - without the Hausaltar and without the shepherds - is preserved in the Bayerisches Nationalmuseum, Munich (inv. no. 30/270), and it is interesting to note that the figures of Mary and Joseph, together with the architectural setting of the crib, are identical. However, the fully documented Hausaltar in the Prague Loreto Treasury provides the most telling evidence of the fashion for these silver figures without bases. Indeed, without his pannier the Elias Lencker grapepicker could join the shepherds on the steps of the Hausaltar without seeming in the least incongruous, although the scale might need to be adjusted slightly. Similarly Christoph Lencker in Augsburg, together with Jeremias Gilg, created the artistically and technically ambitious silver group of St Veronica helping the Fallen Christ as a tall Roman soldier towers over them (now preserved in the Württembergisches Landesmuseum, Stuttgart - see ‘Welt im Umbruch’ 1980, pp. 314-15, with illus.). This masterpiece and a few other ecclesiastical survivals shed some further light on the great skill of the south German goldsmiths, who attempted to create fine sculptures in the round. The daring way in which Elias Lencker has made this figure of the grapepicker without any stand may have been innovative, but it is probably one of his late works of the 1580s and other goldsmiths may have been attempting similar things by that date. Certainly, it is debatable whether this figure was originally intended to be used as a drinking-cup, as was stated in Read 1902. The pannier on the peasant's back could be used as a cup, but perhaps these sculptural pieces of plate were designed more for display at Court than for use. Dora Thornton, 'A Rothschild Renaissance: Treasures from the Waddesdon Bequest', British Museum, London, 2015, pp.296-299.